/ Is Ebates a scam or legit? Ebates has been around since 1999. It is a cash back site where you get some cash back from the purchases you make. You can also receive cash when you refer others to sign up via your affiliate link. To become a member, you must be at least 18 years of age and have an email address. The site is not accessible to residents of the European Economic Area. In short, you login and create a free account. You make purchases at your favourite stores through Ebates, and you receive cash back either into your account, or in-store. You can also save with thousands of coupons and promo codes. There are new sales and deals added daily to help you save with cash back. The great thing about cash back sites is that they save you money if you are going to make the purchases anyway. You may as well save while you shop and put the savings back into your pocket. Downloading the Ebates Cash Back Button (on Safari) will help you with your cash back shopping, and will also automatically apply coupons at the check out, ensuring you don’t miss out on any good deals with respect to your purchases. There is an Ebates app for iPhone, Android and iPad. The app shows special offers and extra cash back, and daily deals. Ebates have a rotating selection of stores that offer double cash back, so it’s always worth checking the double cash back stores before making your purchase. For example, looking just now, Nike is offering 10.0% cash back (was 1.5%) and shoes.com is offering 12.0% (was 6.0%). Whilst Ebates is predominantly an online cash back platform, they also offer in-store cash back. To do this you need to add your credit card to your Ebates account. Then, find the store you’re after in the “In-store cash back” section of the Ebates site. Say for example I know I’m going to go nuts at the Lindt store. I find Lindt, then I link the offer. 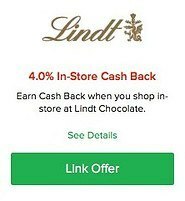 When I go into Lindt, I pay with my credit card (the one that I added to my account). This current offer is available to 30 September 2018. The purchase requirement and reward amount can vary. Generally, you will receive your referral bonus within 60 days of your referral’s qualifying purchase. There are two ways to get paid through Ebates. You can either choose the “Big Fat Check” method, where you provide a mailing address and a check is mailed to you. You can also choose to be paid to your PayPal account. Whilst the payments only happen on a quarterly basis, the feedback about payment is generally positive. Some people do like to be paid more frequently than quarterly, so that might be annoying for some. Is Ebates a scam or legit? It’s LEGIT! Ebates is absolutely legitimate. It has a very solid reputation, and is an excellent way to save money on your shopping. All savings add up, so why not get the benefit? You have nothing to lose and everything to gain. Drop me a note below and I’m always happy to answer any questions. If you’ve found any other legitimate ways to make money online, please share them below. If you’d like me investigate any programs for their legitimacy, I’d be happy to.